Options: 20 lb. 3 lb. Improves soil sulfur levels as well as replenishes loss associated with soluble plant nutrients. Low dust sulfur and iron formulation on homogeneous pastille-shaped granule. 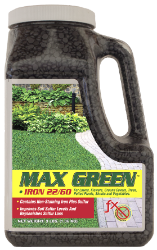 Use in conjunction with a balanced lawn fertilizer program. Contains 22% non-staining Iron plus 60% Sulfur.